Wearing the Size 6 regular. apologies for the blurry side photo but I couldn't figure out how to best angle myself to show the gapping at the armhole and in back. 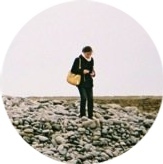 You can click on each photo to get to the full size image. 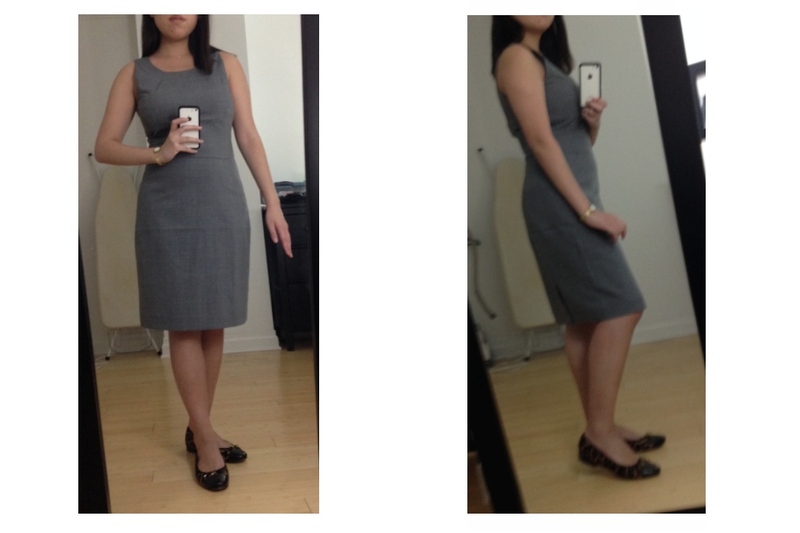 This is a review of the J.Crew Factory Tailored Shift Dress in Lightweight Wool, which I will return. I wanted it to work so badly! I actually put in my order in mid-March, but it was back-ordered auntil now. I ordered more sizes (6, 8, 8P and 10P) than I usually would because I wanted to guarantee that I found the best size for me. While I'm fairly certain that my "best size" for this dress was included in my order, the design itself just isn't right for me. For fit reference, I'm 5'3'' and 36''-26''-37'' with "regular" torso and shoulders but "petite" short legs. Note: the above and below text contains affiliate links that will result in a few cents commission for me if you click. Thank you for your support! For those who find that the design and fit suits them, this dress could be a good addition to an intern or entry-level professional's office wardrobe. The price point for an all-wool dress (the full lining is polyester) makes it a good value: typically around $75, though I got mine for ~$65 during an additional percent off promotion. The style is right: It's a quintessential sheath dress that could be business formal with the right blazer or business casual otherwise. Unsurprisingly for the price point, the wool is not especially high quality. The texture is visibly rougher than that of the J.Crew Super 120s Paley wool pants I tried on a while back (discussed here), though the material is also not as paper-thin. Overall, if it fits you well, it's good for someone shopping at the summer intern or young professional <$100/dress via sale or promotion price point. That is, by the way, the price point I shopped at to build most of my current work wardrobe. Wearing the Size 8 petite. I angled myself differently for the side photo here, so you can't see the gapping as badly, but you can see that my bra is peeking out at the armhole if you click through. Sadly, there are so many details that don't work for me: Round necklines can emphasize my chest in an awkward way, which is happening here, and those little darts sewn in at the collar might exacerbate that. 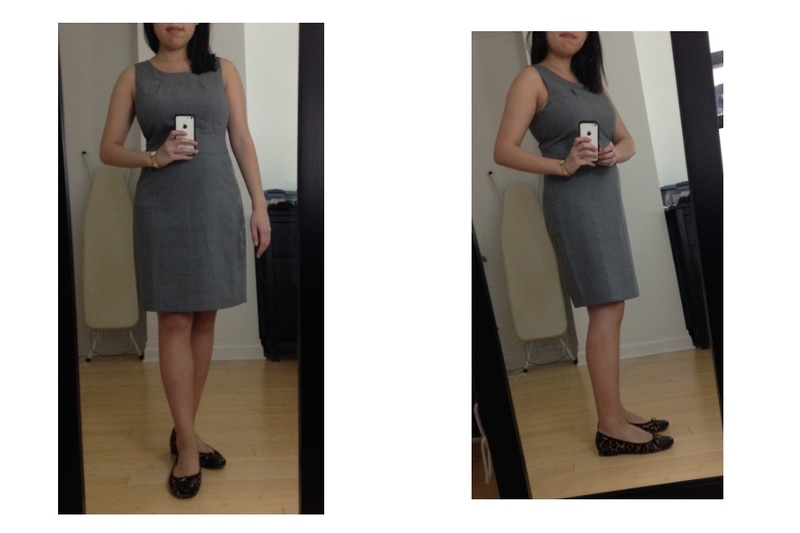 This design runs a bit small in the chest relative to other sheath dresses (both the 6 and 8P are just-right at the widest part of my chest while I'm often a 4 regular for the J.Crew and Ann Taylor sheath dresses I've tried on in recent years). Yet, mysteriously enough, there was also substantial gapping and wrinkling from extra fabric in the back and right underneath my chest for both the regular and petite sizes. Also, even my lower-coverage bras show at the armhole despite the armholes themselves being average-sized, which is odd. I like the thicker waistband and think its flattering, whether at the natural waist (with the regular sizing) or slightly higher (with the petite version). Either way, this dress just isn't good for my body shape. The length of the petite size is a little more flattering than the regular for me, and I don't mind that the waistband sits slightly above my natural waist. The regular sizing is ultimately the better fit, though, as the neck and sleeves on the petite version are cut a little too narrow, when viewed from the front, such that my bra strap inevitably shows if I move around.